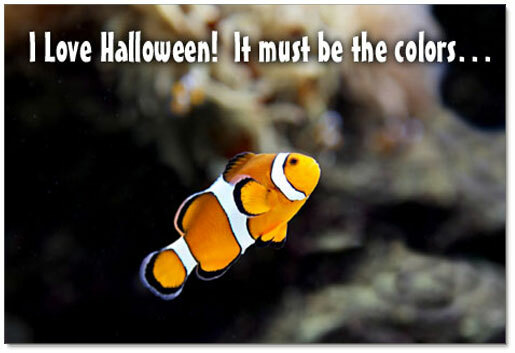 Happy Halloween Everyone !! Hope everyone is having a good breeding day ! Today, since Dakota did her blog on horse hud thought I do one on K-9 hud an how it works. To get a K-9 HUD you can click on any of your Amaretto K-9s and that will bring up the main menu. On the menu you will see Help, if you click that you will get another menu that has a button on it labeled hud. By clicking the hud button you will receive a K-9 hud sent directly to the objects folder in your inventory. Go to objects folder and find the hud, right click it and go to wear. It will attach to the upper left hand side of your screen. You can adjust this if you wish. Large half circle: States what mode your K-9 is in Fetch. Connect button: Looks like a plug with both ends together. This is to connect your K-9 to the hud. Disconnect button: Looks like a plug with the ends not together. This is to disconnect your K-9 from the hud. Animations (avatar petting a K-9): This button, when clicked, will bring up a menu which has petting options as well as the walk animation. To connect your K-9 to the hud, click the K-9 and then click the hud button on the menu then click the connect button on your HUD. Make sure your K-9s movement is set to physical before connecting to the hud. 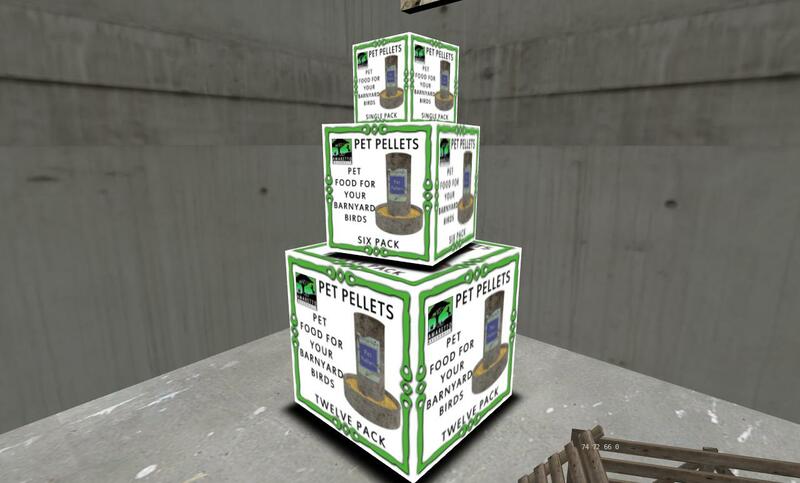 To play fetch, get a fetch item from the green ball button as described above (ball, stick or newspaper) and wear it from your inventory objects folder. Click the fetch button on the hud and go into mouse look (bottom of your screen) and left click to throw the item. Your K-9 will run to fetch and bring it back to you. To change the range on how far you throw the item, click the item in your hand and set the range from the menu given. To make your K-9 stay put simply click the stay button and they will stay where they are and not follow you. To make your K-9 come to you click the come button and they will come. To make your K-9 follow you click the follow button and they will follow where you go. The animations button will bring up a menu to pet your K-9 or to walk them. To pet your K-9 choose one of the different “size” animations. To walk your K-9, wear the leash (from the green ball button) and the K-9 will connect to the leash and you can walk them around on your sim. 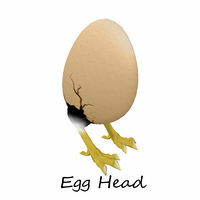 Until nest week Happy Breeding !!! Happy Thursday! Today I am shining the Spotlight on a couple of features in the horses that go unused far too often. The Brushing and Feeding Animations! 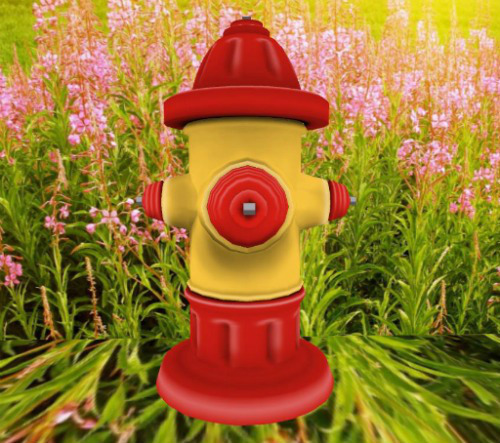 These 2 awesome animations are super easy to use, fun and also they make for great picture taking opportunities. Click your horse, choose the Help button and then pick Get HUD. Wear your HUD and rez your horse in world. Click the animations button on the HUD and you will see the Brush and Feed Animations. Wear or add the Brush and you will get a pop up menu with different grooming options. Wear or add the Apple and you will get a menu option to choose your avatar size. So see now you can have even more fun with your horses simply by playing around with the Horse HUD. Until next week, Happy Breeding!! Amaretto Halloween Carnival 3 days of Spooky!! Today was the opening day of the Amaretto Halloween Carnival. If you haven’t checked it out yet you really should!! Lots of rides , foods, haunted houses and spooky stuff. The Carnival is for 3 days, starting today and will continue til November 1st, so everyone can go and have a great time.Ohhhh and watch out for the blue ghosts, lol they just want to hug you!!! Take you Hearse ride Here! 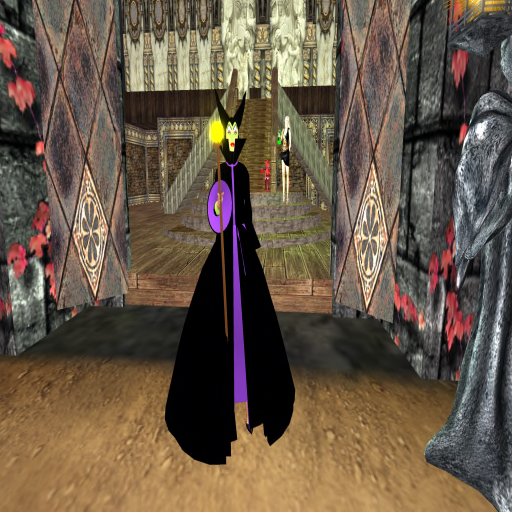 Tomorrow Ava will be DJ for the Carnival Spooky Dance, October 29th at 5:00 pm (slt). You can come in costume or just as you are, you will still have a great time!! Don’t miss these!!! They are here at the Carnival Too!!!! Below are some pictures from today at the Carnival! See you at the Carnival Dance Tomorrow!!!!! Hey guys its Tuesday and what a terrific one!!! Everyone has been asking and it is my turn to announce the November Twist Horse and K-9. From November 5th 2014 until December 5th 2014 you can breed any color Percheron and any color Amaretto Saddlebred together and you have the chance of discovering a brand new coat designed especially for the Twist called Dapple Saddlebred! This is just one of many Percheerons that can be used for the twist! The Dapple Saddlebred, will have its very own eye that will have the ability to pass! Now for our K-9 Lovers we didnt forget about you guys! Novembers Twist K-9s I am excited for this one guys and I hope you are too! From November 5th 2014 until December 5th 2014 if you breed any color Wolf and Bi-Color Beagle you have a chance at getting the new twist named Beawolf! Check them out on the wiki from the links above! The Beawolf will get a special eye and collar that will have the ability to pass! Don’t forget that the coat on the Beawolf as well as the Dapple Saddlebred have the ability to pass! Good luck breeding and I can’t wait to see these in world!!! 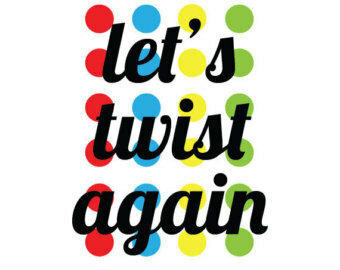 So get to twisting! This is Ava over and out! Happy Breeding Everyone!! Today we threw an awesome event… Hallowfishing!!! It was a super fun and interesting!!!! We had so many people show up! You definitely want to keep an eye on our groups because we at Amaretto love throwing spontaneous events! The lucky winners today were fishing for Halloween LE’s and consumables! Below is a list of winners and the goodies they won! FIRST PLACE: SorchaLia Resident won a Halloween 2014 Limited Edition 4 pack and a Limited Edition Candy Corn Pack for horses! SECOND PLACE: Luckystrike Maven won a Halloween 2014 Limited Edition random pack and a Limited Edition Candy Corn Pack for horses! THIRD PLACE: Jasperr Burnstein won a Halloween 2014 Limited Edition random pack. FOURTH PLACE: Shawndra Magic won a Single Breedable Food and Salt Lick. FIFTH PLACE: Veronica SpiritWeaver won a Single Breedable Food and Salt Lick. Congratulations to all of our winners!! Thank you to everyone who came out and attend this super fun event! Keep your eyes and ears open for you never know when we may throw a random event again. Also, don’t forget to get to the Amaretto stores to pick up your Limited, Special, or Collector editions!!! Treats for the Amaretto Community! Its that time of year again where all the children are buzzing around with talks of treats and candy. Tricks or treats the choice is yours but Amaretto’s been making a few treats for the entire Amaretto community! 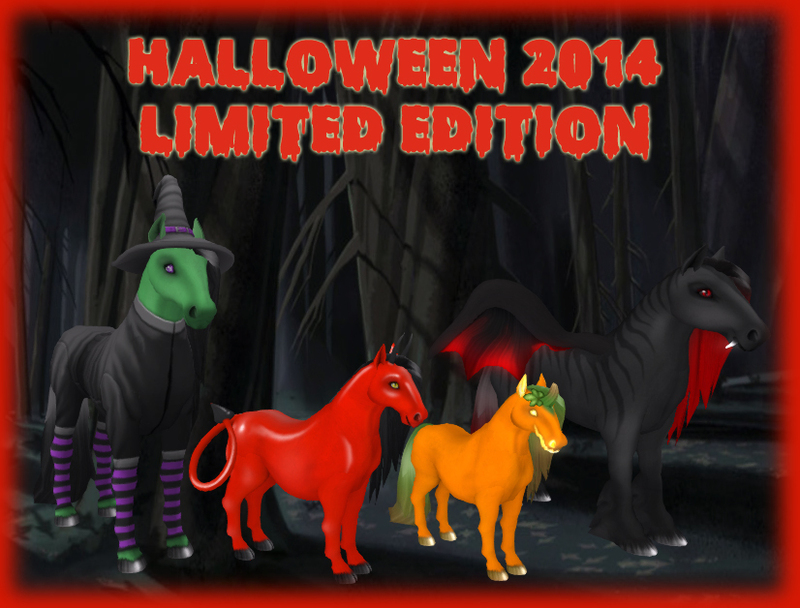 Introducing to you the 2014 Halloween Limited, Special, and Collectors Editions! Thats right starting tonight October 24th, 2014 until November 3, 2014 you can pick up your at any Amaretto location let me tell you all about these ghoulish creatures! So run out there and get your Halloween 2014 Limited, Special, and Collector Editions!!! Until next time Happy Spooky Breeding! Today I would like to tell you about some of the the Amaretto Barnyard Bird , Exotic Birds and Class. The Class stat classifies the birds stats. Any future class traits will be added to your current Bird of the Line through an update. 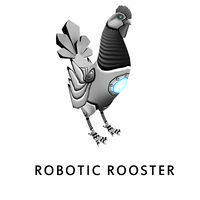 The Robotic dose NOT pass their breed or eyes. However, you could get extremely lucky and birth another Exotic Bird. Happy Thursday Amaretto! Today I wanted to shine the spotlight on something that can be lots of fun of fun while you are waiting on those bundles to drop. Racing!!! That’s right you can race your Amaretto horses or train them just for fun to increase their speed and stamina traits. Remember your horse must have the racing traits first before you can train them. Now let me include all the pertinent information you’ll need to begin training or racing your horses. Remember riding your horses boosts not only their happiness but yours as well! If you need a place to race or train your horses you are always welcome to use the Amaretto Racetrack at Boomtown. This slurl will take you to the racetrack all you need to bring are your horses and your friends and there will be fun had by all! You can also attend the AMOC races each month to join in on the racing fun. Watch notices for dates and times! Until next time Happy breeding and Happy Racing! Today I want to talk about the Barnyard Birds! 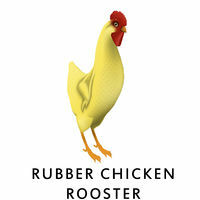 I have listed below a list of the consumables available at all Amaretto Barnyard Bird Stores and what they are used for. Barley Bird Diet is the food that keeps your Barnyard Birds healthy and able to breed when its time. Without a source of food the Barnyard Birds will become sick and will need to either eat their way out of starvation or be healed using a Flu Shot. 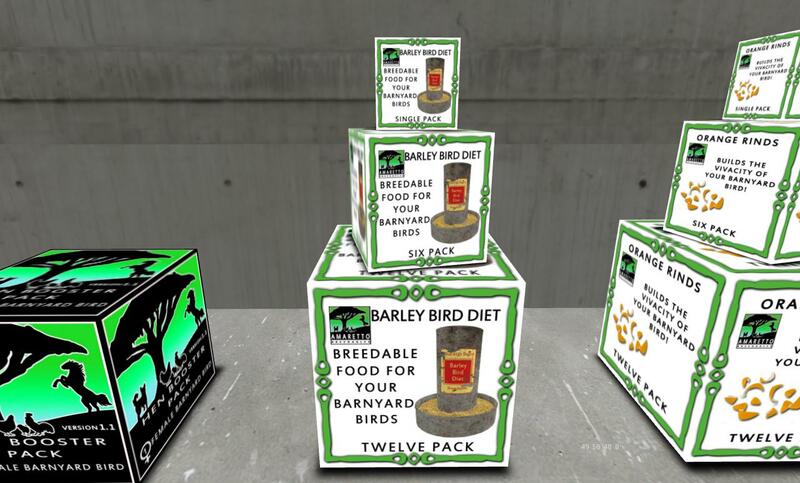 Stock up on Barley Bird Diet today and keep your birds healthy and breedable. Do you have Barnyard Birds you want to keep only as pets? If you do then Pet Pellets is the food for you! Pet Pellets will keep your Barnyard Bird healthy not just when they are Seniors but also on those younger birds you simply do Not want to breed. Without a source of food the Barnyard Birds will become sick and will need to either eat their way out of starvation or be healed using a Flu Shot. Stock up on Pet Pellets today and keep your birds healthy! 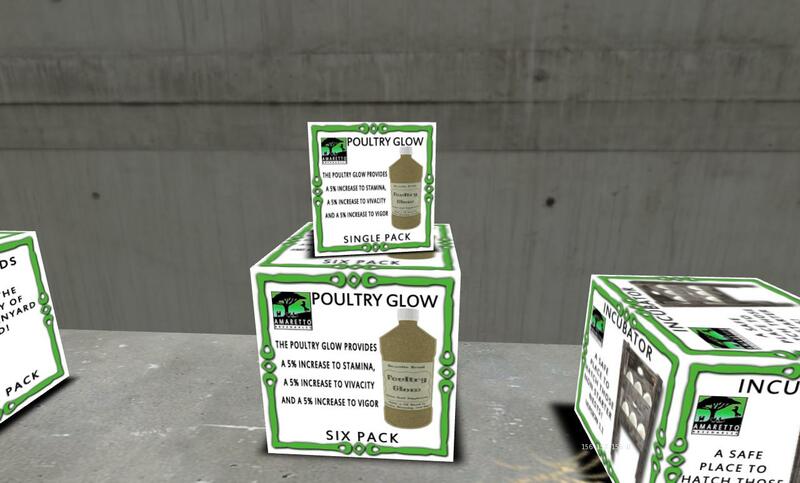 Poultry Glow provides a 5% increase to Stamina, a 5% increase to Vivacity and a 5% increase to Vigor. 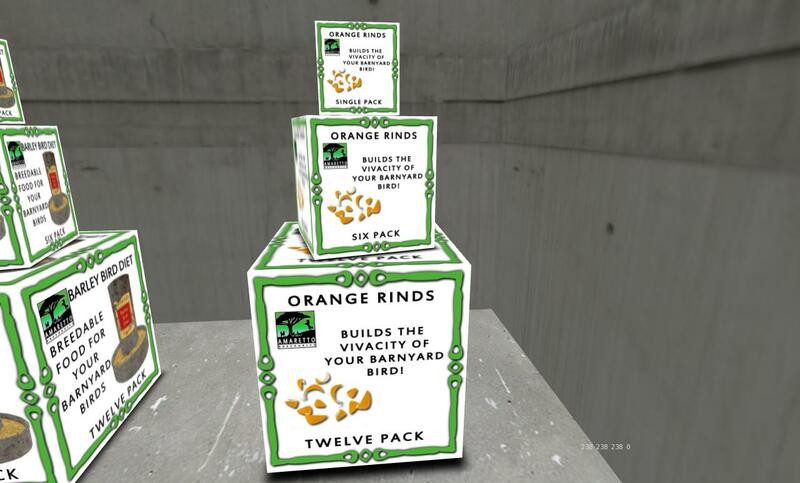 Vivacity Corns will increase one of your birds vivacity by 15%. 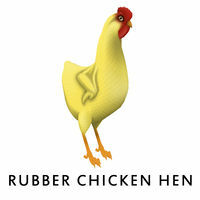 This consumable can only be used on a Barnyard Bird once in a 24 hour period. 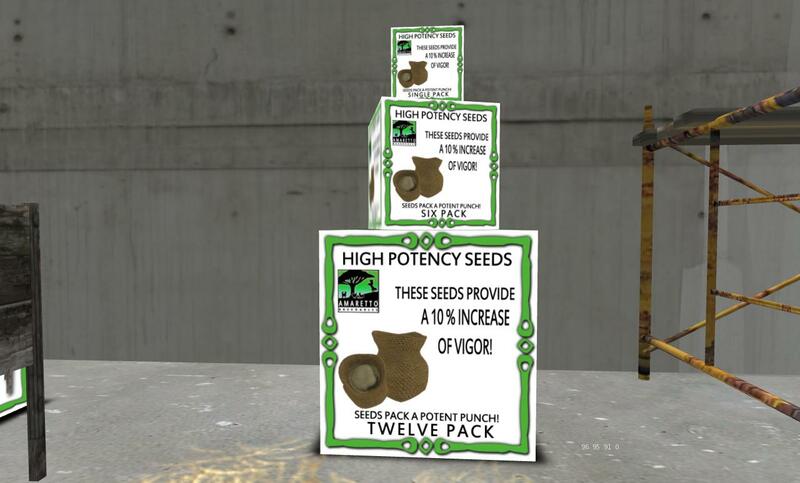 High Potency Seeds-provide a 10% increase to Vigor. 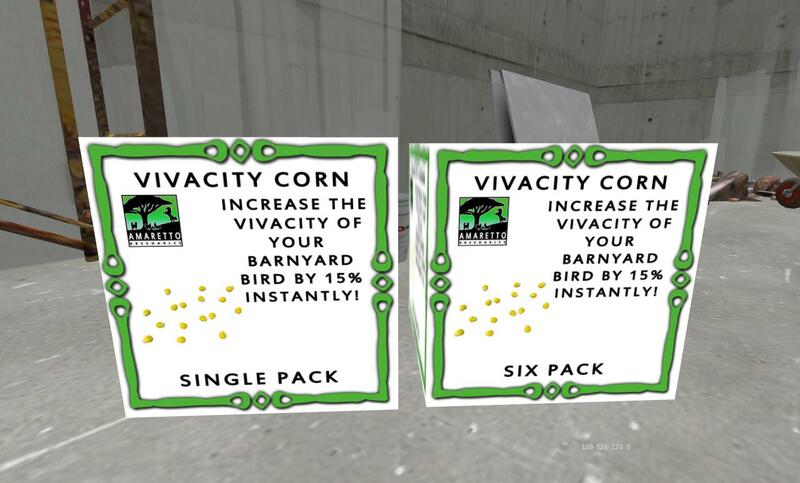 Vigor is important as your Barnyard Bird must have 85% or higher vivacity coupled with 100% vigor in order to breed. 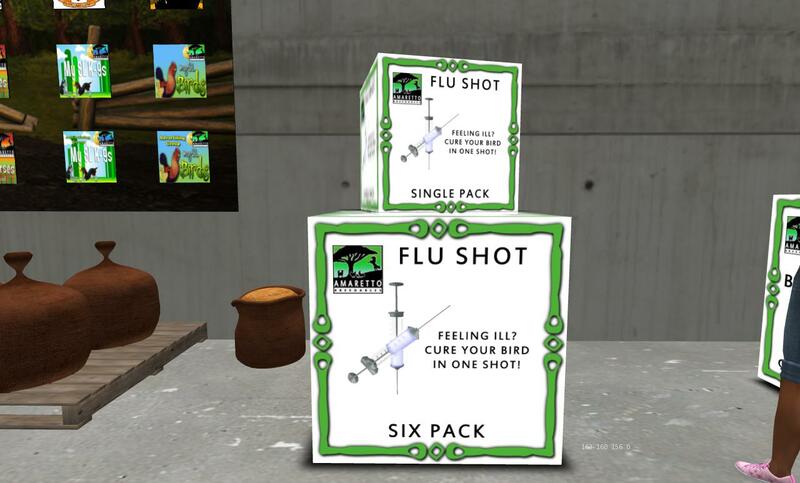 Flu Shot-Once your Barnyard Bird is sick it will take 4 days for it to eat its way out of sickness, or you can purchase a one-time use Flu Shot that will heal one Barnyard Bird instantly! As you can see you can get everything you need to keep your Barnyard Birds fed and healthy all in one store! Next I want to talk about the Bird Sanctuary! Bird Sanctuary is a awesome way to send those unwanted or unneeded Barnyard Birds off to a special place and in return you can earn Henny Pennies. 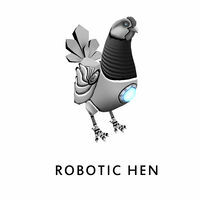 Below I will show you how much Henny Pennies you can earn, and ways you can use Henny Pennies for some awesome Barnyard Bird products. 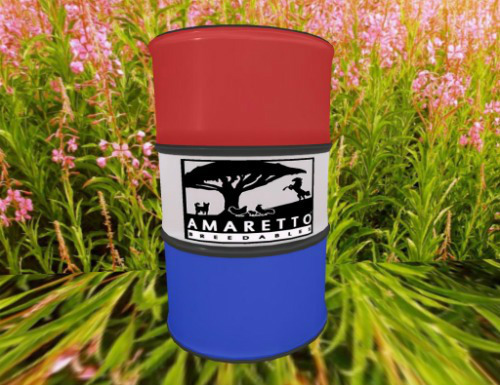 You can find a Bird Sanctuary Vendor at any Amaretto Ranch Barnyard Bird store locations with the exception of the main Barnyard Bird location because we have the Amaretto Haven sim located right next door!! Amaretto has put precautionary measures in place so that you do not accidentally send any Bird to Bird Sanctuary. You MUST confirm before anything is sent to Sanctuary. This means that no Bird will be returned to you from Bird Sanctuary accident or not. So please make sure that this is what you want to do!!!! Raising Barnyard Birds is fun and exciting! Did you know that if you turn their animations on and their extra animations on that you can bump your bird from behind and it will flap its wings, run a squawk? Well try it sometime it is fun to watch them! Until next time, enjoy breeding!!! Let’s Look At The GPS! Howdy breeders! Today I would like to cover the GPS. We have a GPS for each of our breedables. We have the Global Pony Settings barrel for horses, the Global Pup Settings hydrant for K9, and the Global Peck’n Sort silo for birds. 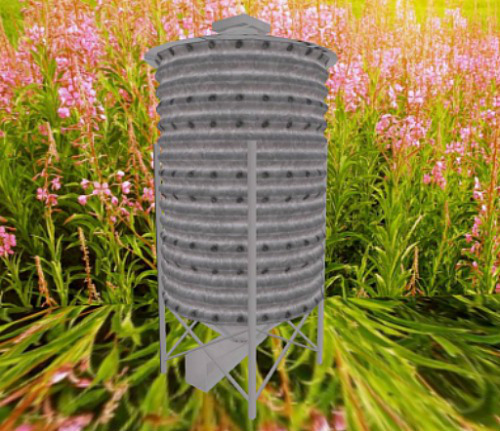 These nifty devices were created to make life just a bit easier for breeders. The GPS turns possibly hundreds of clicks into a handful of clicks. 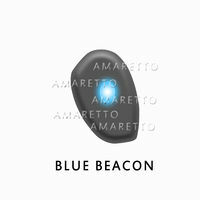 The GPS is a FREE device that is given out at any Amaretto Horse, K-9, or Barnyard Bird Store. Before we get into how these awesome devices work, it’s important to point out that the GPS will set all the horses, k9, or birds in a sim that are listed under the owner’s name. It’s important to remember this if you have special pens set up to manage special projects. Please also remember that there is a separate GPS for each of the three Amaretto Ranch Breedables. This will allow you to set the range on your breedables. When you click this button you will put in local chat the range you wish your breedables to be set at. Once you have made all the changes you would like to make to the settings of your breedables click Activate from the drop down menu and all your settings will be activated. If your text setting is left in the on position, you will probably notice the text on your K-9s will go off and then come back on. With this option you can keep the Home setting where it was or tell the GPS to reset the home on all rezzed breedables to their current location. This allows you to set the text to off. This allows you to set the sounds to on. This allows you to set the sounds to off. This allows you to set the animations to on. This allows you to set the animations to off. This allows you to set the text to on. This allows you to set the movement of your breedables to physical. When set to physical your breedable will not walk through other objects. This allows you to set the movement of your breedables to phantom. When set to phantom your breedable will walk through other objects. This allows you to set the movement of your breedables to off.